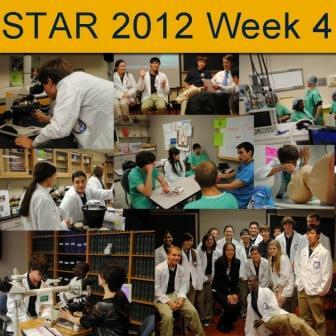 (June 25, 2012) The first week of STAR kicked off with action-packed rotations and lectures. The students were introduced to allied health professions, FBI cell phone and internet safety, pediatrics/craniofacial surgery, the cancer center, The University of Queensland, the medical library and archives, radiation oncology, and team building. Thank you to all the staff and faculty who participated with the STAR students: Carl Tholen (Allied Health), Dr. Richard Milani (Cariovascular Wellness), Randy Jordan (FBI), Ethel Madden (Medical Library/Archives), Valerie Hensarling (Radiology), Dr. Kay (Radiology), Terri Bice (Radiology), Dr. Daniel Bronfin (Pediatric/Craniofacial Surgery), Scott Peters and Kathryn Vreeland (University of Queensland), Georgette Barnes and Cristine Stamm (Cancer Center), Raj Mitra (Radiation Oncology), Dr. Paula Gregory and Dr. Jawed Alam (iLab), and Whitney Smith (OD&T). For more information about Education Outreach at Ochsner or to get involved, contact the Education Outreach office at 504-842-5321, email educationoutreach@ochsner.org , or visit the Education Outreach website. Education Outreach serves the community and maintains Ochsner’s position as a national academic leader by supporting educational development, providing unique academic resources, and connecting students and teachers with innovative academic opportunities. 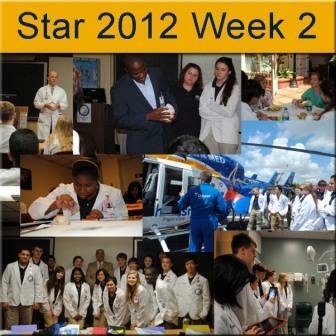 (June 25, 2012) The second week of STAR kicked off with informative and hands-on rotations. The students were introduced to basic medical terminology, executive academic and research administration, flight care, graduate medical education, psychiatry, neurosurgery, medical illustration, internal medicine, labor and delivery/maternal fetal medicine, and the neonatal intensive care unit. Thank you to all the staff and faculty who participated with the STAR students: Janice Piazza (Academics); Dr. Sohail Rao (Research); Dr. Julia Cook (Molecular Genetics); Ian Nygren, Tiffany Rafael, Candace Bridges, Mitch Lartigue, Larry Hansen, Randy Kiley, Christy Gallois, and Diane Niddrie (Emergency Department); Donna Guidroz (Graduate Medical Education); Dr. Jawed Alam (Basic Science Research); Dr. Galarneau (Psychiatry); Dr. Sulaiman (Neurosurgery); Barbara Seide (Medical Illustrations); Dr. Deichmann (Internal Medicine); and Drs. Hamilton and Gala; and Jeni Ducoing (Labor & Delivery). 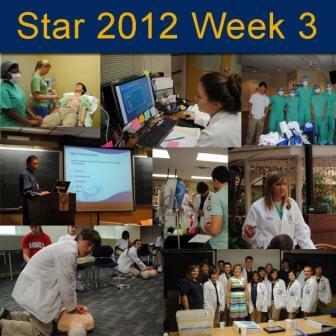 (July 5, 2012) STAR Program third-week highlights included Executive Hour—featuring Ochsner CEO Dr. Patrick Quinlan and executives from Ochsner’s divisions of Academics, Philanthropy, and Undergraduate Medical Education—who gathered to get acquainted with the STAR students. In addition, the STAR students had various clinical and nonclinical rotations with respiratory care, advance practice clinicians, pathology, medical publishing, sports medicine, occupational/physical therapy, rehab, and the research labs. The students received training in leadership development, basic presentation skills, and CPR. Thank you to all the faculty that participated with the STAR students: Dr. Patrick Quinlan (CEO, Ochsner Health System); Dr. William Pinsky (Chief Academic Officer, Ochsner Health System ); Anna Combes and Dee McCloskey (Philanthropy); Carl Tholen (Undergraduate Medical Education); Mary LaBiche (Respiratory); Fiona Winterbottom, Stephanie Ledet, and Bethany Jennings (advance practice clinicians); Dr. Rebecca Murray (Pathology); Mallory Lindsly and Rita Premo (Publishing Services); Susan Salomone and Mary Lunsford (Organizational Development); Drs. T. Cooper Woods and Chasity Coleman (Cardiovascular Research Lab); Dr. Jawed Alam (Molecular Genetics Research Lab); Graylin Jacobs (Sports Medicine); Kris Huber (rehab); and Kay Eddleman, along with her Community Training Team. Every week, the STAR students construct a weekly newsletter to highlight their experiences. Click here to check out our STAR program. (July 9, 2012) With only two weeks of the STAR program to go, the students are ready to finish strong. This week’s highlight was undoubtedly the surgical rotation when the students witnessed a surgery performed with the state-of-the-art DaVinci robot. The students then had the opportunity to practice with the robot and hone their own surgical skills. In addition to surgery, the STAR students had various clinical and nonclinical rotations during week 4, including a visit to the blood bank/collection center, cardiology luncheon, instruction in bedside manners and interview skills, lab research, and a clinical skills training introduction. During the skills training introduction, the students learned how to tie sutures, take a patient’s history, perform basic airway management, take patient vitals, and perform basic phlebotomy. Thank you to all of the faculty who participated with the STAR students: Ken Detiveaux/Judy Valenza (blood bank), Dr. Hector Ventura (cardiology), Dr. Maureen Shuh (transplant research), Dr. Kevin Conrad (hospital medicine), Karen Judlin (Organizational Development), and Ochsner Clinical School/The University of Queensland students Kathryn Vreeland, Jonathan Tran, Jose Feliberti, Thekla Bacharach, and Andrey Pavlov. 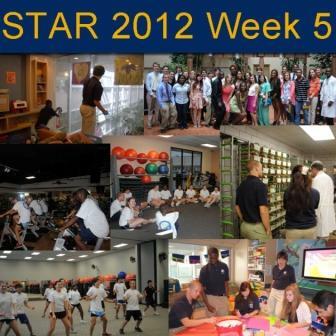 (July 16, 2012) The highlight of STAR week 5 was undoubtedly the job shadow opportunities. The students choose a medical specialty of interest and shadowed a physician in that specialty for 3 hours. During the job shadows, the STAR students were able to talk one-on-one with the physicians to better understand the work environment and the knowledge required. In addition, the STAR students had various clinical and nonclinical rotations and presentations during week 5: the Center for Health Research/Public Health, Pharmacy, Patient Education, Clinical Research, Spirituality & Health, Diabetes Awareness, Medical Radiation, Mock Clinical Exam, Give Back Day-Child Life, Animal Ethics, and a full day at Elmwood Fitness Center. The STAR program will officially end with the Culmination Ceremony on Thursday, July 19. Thank you to all of the faculty members who participated with the STAR students: Dr. Marie Krousel-Wood (Center for Health Research); Dr. Jenny Puchot, Cindy Frisard, and Linda Nicholson (Pharmacy); Kelly Fogarty (Medical Library/Patient Education); Fr. Anthony DeConciliis (Spirituality & Health); Peggy Bolton (Diabetes Awareness); Carl Tholen (Medical Radiation); Ochsner Clinical School/The University of Queensland students Jonathan Tran, Jose Feliberti, Thekla Bacharach, and Andrey Pavlov; Drs. George Gilly, Kristinza Marton-Mravik, Brian Porche, Charles Sea, David Kirsch, David Coffin, Joanna Togami, William Carter, Daniel Morin, Rajiv Gala, Hector Ventura, and Georgia Lea (job shadows); Christine Ferry and Desiree Hyde (job shadows); Phyllis Dotson, Barbara Doskey, Katharine Robicheaux, and Kathryn Sahuque (Child Life); and Dr. David Hesse (Animal Research).